Due to the future release date, a bundle which includes this title will not ship until April 23, 2019. Adie Lou Kruger’s ex never understood her affection for the ramshackle summer home that she’s inherited on Lake Michigan. But despite the fact she’s facing a broken marriage and empty nest, memories of happy childhoods give her hope. 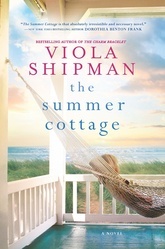 She’s determined not to let her husband’s affair reduce her to a cliché, so it becomes clear what Adie Lou must do: rebuild her life and restore her cottage. But converting the weather-beaten structure into a bed-and-breakfast isn’t quite the efficient experience she’s seen on TV. Pushback from the preservation society, costly surprises and demanding guests were not part of the plan. But as the cottage comes back to life, Adie Lou does, too, finding support in unexpected places.